Vancouver based Nest Designs started with the simple philosophy that baby gear doesn’t have to look babyish. Their bandana-style bibs and swaddling blankets are sophisticated in appearance and soft to the touch. Made with a signature blend of cotton and bamboo, these simple accessories feature clean, modern lines and neutral, unisex colors. The bibs look cool and catch drool, while the blankies are generously sized with ample room for a cozy swaddle. Based in Vancouver, BC, Nest Designs was founded by Tammy Lo. A graphic artist and package designer, she was inspired by her niece to create a line of infant wear that was practical and aesthetically pleasing. An avid doodler, Lo draws unique free-hand patterns with visual inspiration from Native American culture. The bamboo-muslin cloth softens beautifully with every wash and makes for great teething material too. Wrapped with two in a pack, these unique gifts will be a favorite of both mother and child. I am the designer and creator of Nest Designs and am excited to be launching today on The Grommet. Designed with the finest bamboo blend, our blankets and bibs come in chic designs to keep you and your little one in style! This bamboo blend is very absorbent, extremely soft and durable, so you can wash them over and over again without a worry. We hope they can find a place in your home as it has in ours! At last. . .someone who understands that pink and blue with cartoon characters and trucks is not for everyone! Thanks ladies! we are glad you like them! Vancouver based Nest Designs started with the simple philosophy that baby gear doesn’t have to look babyish. Their bandana-style bibs and swaddling blankets are sophisticated in appearance and soft to the touch. Made with a signature blend of cotton and bamboo, these simple accessories feature clean, modern lines and neutral, unisex colors. The bibs look cool and catch drool, while the blankies are generously sized with ample room for a cozy swaddle. 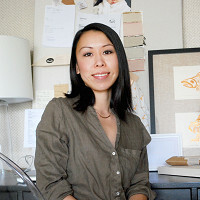 Based in Vancouver, BC, Nest Designs was founded by Tammy Lo. A graphic artist and package designer, she was inspired by her niece to create a line of infant wear that was practical and aesthetically pleasing. An avid doodler, Lo draws unique free-hand patterns with visual inspiration from Native American culture.